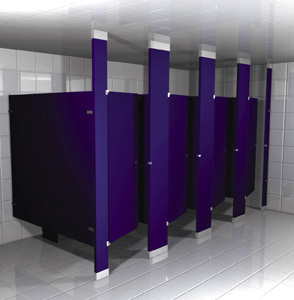 Prestige Distribution, Inc. furnishes and installs Powder Coated Metal Toilet Partitions manufactured by Hadrian, Inc. With a low cost and high performance, Hadrian powder coated toilet partitions are an industry best value. Hadrian utilizes the latest powder coating technology to apply a hard, even, and run-free finish that resists impact, rusting, abrasions, chemicals, detergents and acids. Should vandalism occur, power coated toilet partitions can be easily repaired. With a proven ASTM D6587 resistance to materials such as permanent marker, lipstick, water based ink marker, wax crayon, and spray paint, Hadrian's anti-graffiti toilet partitions allow the use of commercial graffiti removers without damage to its surface or a "ghost" of the graffiti left behind! Made of 50% recycled materials and no solvent emissions, Hadrian's powder coating system is also environmentally friendly. With a Class A fire rating, Hadrian powder coated toilet partitions are fireproof and will not give off toxic smoke if exposed to heat or flame. With a multitude of styles, mountings, colors, and upgrades, Hadrian Power Coated Metal Toilet Partitions are an excellent choice for those not willing to compromise design flexibility for durability and value. Hadrian offers a 3-year warranty on its powder coated metal toilet partitions. Hadrian's "No-Sightline Solution" completely eliminates all sightline gaps around doors with full height continuous stops and hinge side fillers. There are no exposed fasteners on the exterior, which promotes a clean, unobtrusive appearance. Hadrian’s Standard Series features 58” high doors and panels, which are mounted 12” off the finished floor. Available in headrail braced, ceiling hung, floor anchored, and floor to ceiling styles. Hadrian’s Elite Series offers increased privacy with 64” high doors and panels, mounted just 6” from the finished floor. Continuous channels eliminate all sightline gaps. Available in headrail braced, ceiling hung, floor anchored, and floor to ceiling mounting styles. Taking the Elite Series concept a step further, Hadrian’s Elite Plus System affords maximum privacy with 72" high doors and 76” high panels, mounted just 6” from the finished floor. Continuous channels eliminate all sightline gaps. Available in headrail braced and floor to ceiling mounting styles. Hadrian's line of power coated toilet partitions are available in a vast array of colors, textures, special effects, and graffiti-resistant finishes to make your design dreams a reality.